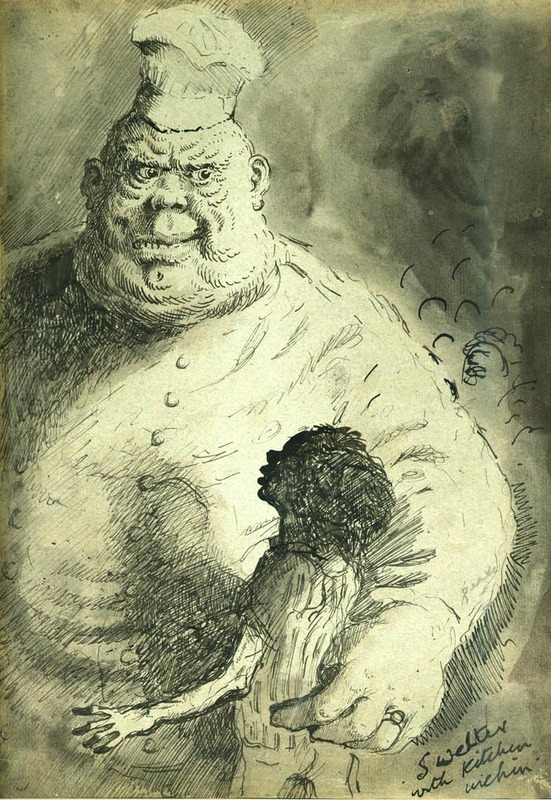 The chef of Gormenghast, balancing his body with difficulty upon a cask of wine, was addressing a group of apprentices in their striped and sodden jackets and small white caps. They clasped each other's shoulders for their support. Their adolescent faces streaming with the heat of the adjacent ovens were quite stupefied, and when they laughed or applauded the enormity above them, it was with a crazed and sycophantic fervour. As Mr Flay approached to within a few yards of the cluster, another roar, such as he had heard a moment or two earlier, rolled into the heat above the win-barrel. The young scullions had heard this roar many times before but had never associated it with anything other than anger. At first, consequently, it had frightened them, but they had soon perceived that there was no irritation in its note today. 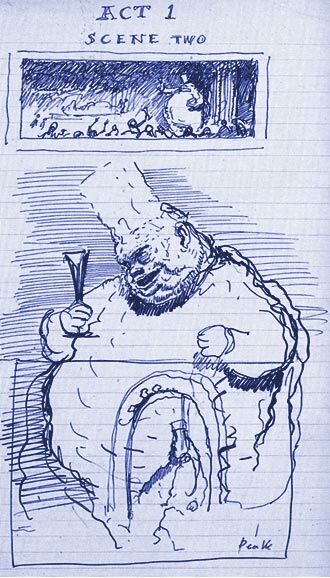 The chef, as he loomed over them, drunken, arrogant, and pedantic, was enjoying himself. As the apprentices swayed tipsily around the wine cask, their faces catching and losing the light that streamed through a high window, they also, in a delirious fashion – were enjoying themselves. The echoes dies from the apparently reasonless bellow of the chief chef and the sagging circle about the barrel stamped its feet feverishly and gave high shrill cries of delight, for they had seen an inane smile emerging from the blur of the huge head above them. Never before had they enjoyed such latitude in the presence of the chef. They struggled to outdo one another in the talking of liberties unheard of hitherto. They vied for favours, screaming his name at the tops of their voices. They tried to catch his eye. They were very tired, very heavy and sick with the heat and the drink, but were living fiercely on their fuddled reserves of nervous energy. All saving one high-shouldered boy, who throughout the scene had preserved a moody silence. He loathed the figure above him and he despised his fellow-apprentices. He leaned against the shadowy side of the pillar, out of the chef's line of vision. Mr Flay was annoyed, even on such a day, by the scene. Although approving in theory, in practice it seemed to him that the spectacle was unpleasant. He remembered, when he had first come across Swelter, how he and the chef had instantaneously entertained a mutual dislike, and how this antipathy festered. To Swelter it was irksome to see the bony straggly figure of Lord Sepulchrave's first servant in his kitchen at all, the only palliative to his annoyance being the opportunity which it afforded for the display of his superior wit at Mr Flay's expense. Mr Flay entered Swelter's steaming province for one purpose only. To prove to himself as much as others, that he, as Lord Groan's personal attendant, would on no account be intimidated by any member of the staff. To keep this fact well in front of his own mind, he made a tour of the servant's quarters every so often, never entering the kitchen, however, without a queasiness of stomach, never departing from it without a renewal of spleen. The long beams of sunlight which were reflected from the moist walls in a shimmering haze, had pranked the chef's body with blotches of ghost-light. The effect was that of a dappled volume of warm vague whiteness and of a grey that dissolved into swamps of midnight – of a volume that towered and dissolved among the rafters. As occasion merited he supported himself against the stone pillar at his side and as he did so the patches of light shifted across the degraded whiteness of the stretched uniform he wore. When Mr Flay had first eyed him, the cook's head had been entirely in shadow. Upon it the tall cap of office rose coldly, a vague topsail half lost in a fitful sky. In the total effect there was indeed something of the galleon.